I spent last Sunday watching the radar. It started about 10 days before and then as we got closer my views on multiple platforms and for different locations grew. 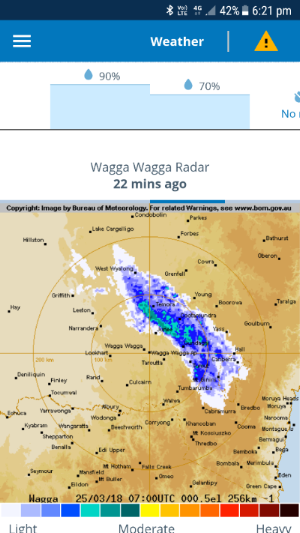 Finally on Sunday my views shifted to the phone and the local radar watching this terrific blue mass (see phone screenshot below) sail across NSW until it seemingly dispersed and yielded us an unspectacular 2mm (it was 2mm when I took the guage off the stand and tilted it towards me - something I have suspected my neighbours of doing for years). In Boorowa we have been lucky to get a start already but after a few weeks we are looking for it again. 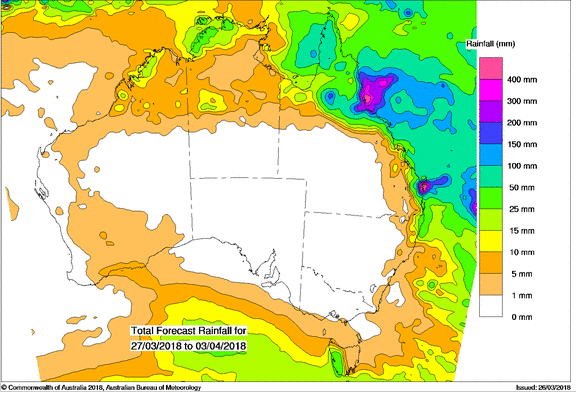 The 8 day forecast does not have anything interesting yet, see below. Enjoy the few notes below on interesting articles from March. 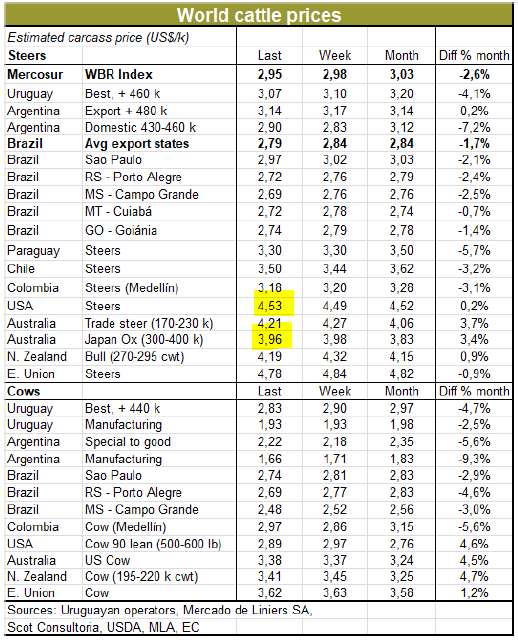 Over the long term there are similarities between the US Live Cattle price and the Qld Heavy Steer price. 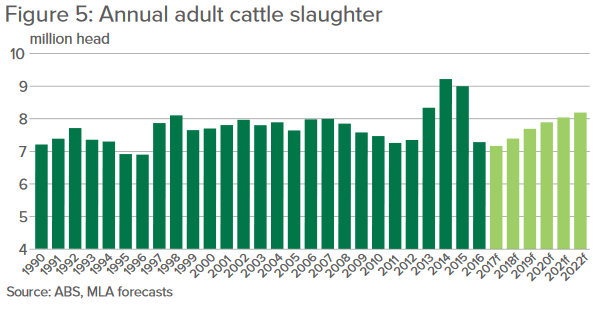 In the period 2020 -2026 the USDA has revised down cattle price forecast by 7.5%. 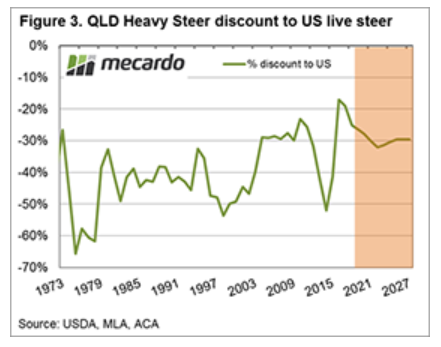 The discount between annual average spread between US live cattle and the Qld Heavy Steer is ste to move to a 30% discount by 2020. In January, Pinnacle Asset Management announced the proposed purchase of JBS’s US feedlot operations, Five Rivers Cattle Feeding for US $200 million.Five Rivers is the largest feeding operation in the world, with 980,000 head feeding capacity in 11 feedlots across the US. Over the period 2008 to 2017 US cattle feeders lost an average of $51.57 per head. The proposed sale marks JBS’s exit from all North American cattle feeding operations, and will herald the first time in decades that no major American meatpacker (including the three main players JBS, Cargill and Tyson) own any cattle. 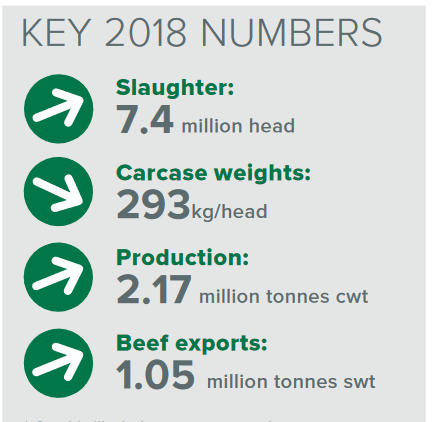 Under the proposed terms, all Five Rivers cattle will go to JBS slaughterhouses, so Pinnacle has a guaranteed customer for its cattle, and at a price and time not disclosed to the commodity exchanges. In March, President Trump announced a 25% duty on steel imports and 10% duty on aluminium imports. While too early to predict the exact retaliatory measures of US trading partners, there is speculation that these could include sanctions against US beef. The impact of such sanctions for Australia is also uncertain. 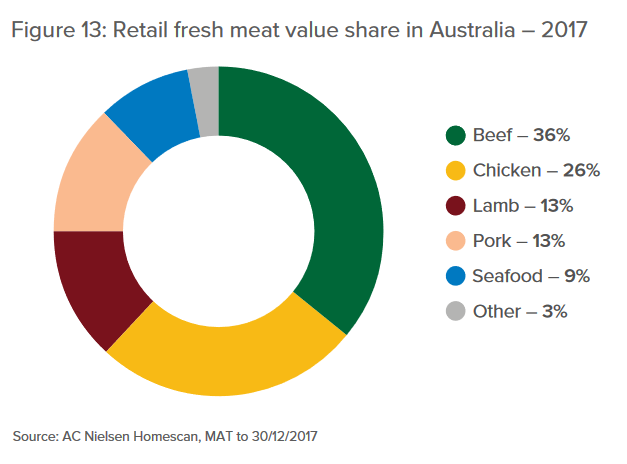 On one hand the sanctions could see US beef exports forced back into the US domestic market, which could impact negatively on Australia’s export prices into the US (in 2017, 23% of Australian beef exports went to the US).On the flip side, retaliatory tariffs on US meat exports in Korea, Canada, Mexico and China could see the value and demand for Australian meat exports to these countries increase. Billionaire hedge fund manager and philanthropist, Sir Michael Hintze, recently predicted that China will be the biggest winner from increased protectionism by the United States. Although President Trump has targeted China with steel tariffs, Mr Hintze highlighted that China is only the 8th largest exporter of steel to the US, so will be barely impacted by the tariffs. China also a major importer of US agricultural products, including sorghum, soybeans, hides and skins and hay – and Australia stands to pick up exports of these products if China reduces imports from the US. China consumer complaining continues to rise and there is sometimes good reason. It was reported that up to 40% of makeup brands sold through China platforms were fake. 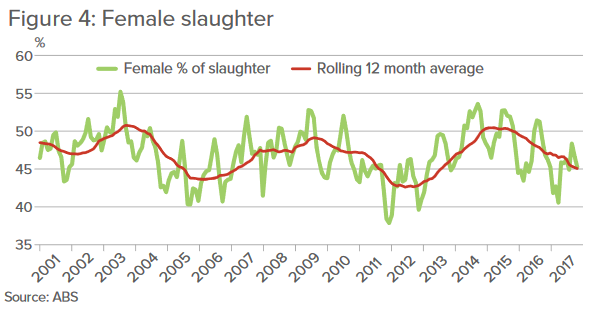 Perfect opportunity to secure autumn calvers that will be well and truly ready to join again may. 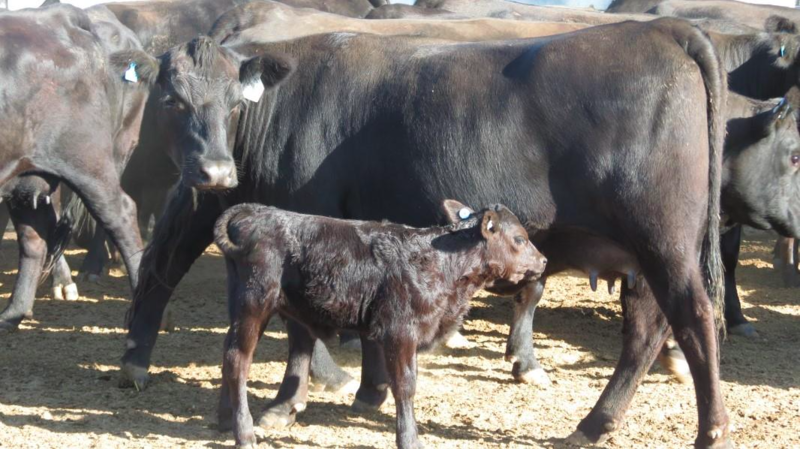 These quality females are rearing calves via ai kennys creek equator j223(ebv's attached). All the breeding is in the calves offering leading genetics in an affordable starting unit. Heifers have proven their mothering ability and are doing a fantastic job on the calves. 1 with pink eye was treated at assessment, 1 with 2 bottle teats, does not seem to be detrimental to cow or calf. Highly recommended units, top quality and condition, all calved unassisted. Want to change how you receive emails from KC Natural?